এই অর্থের সংকুলানের পর নির্বাচনী প্রচারণায় ভারতের মদদপুষ্ট আওয়ামীলীগ জোটের মোকাবেলা করা সম্ভব হয়ে ওঠে খালেদা জিয়ার জোটের পক্ষে। জনসমর্থন ক্রমশ খালেদা জিয়ার জোটের প্রতি বাড়তে থাকে। যতই দিন এগুচ্ছে খালেদার জোটের বিজয় প্রায় নিশ্চিত হয়ে উঠছে। সব মহল থেকে তেমন আভাসই পাওয়া যাচ্ছে। অবশেষে সব প্রতীক্ষার পর এল নির্বাচনের দিন।সকাল থেকে আমি ও রব্বানি আল্লাহ্‌র নাম নিয়ে পরদিন রাত পর্যন্ত খাতা-কলম হাতে টেলিফোনের মাধ্যমে ভোটিং প্যাটার্ন এবং সেই হিসাবে সিটের হিসাব-নিকাশ করতে থাকলাম। বাংলাদেশের ইতিহাসে এটাই ছিল সবচেয়ে ফ্রি আর ফেয়ার ইলেকশন। অনেক সিটের ব্যবধানে বিজয়ী হল বিএনপি জোট। নির্বাচনের অফিসিয়াল ফলাফল ঘোষিত হলে বিএনপি জোট সরকার গঠন করবে সেটাই বাস্তব সত্যে পরিণত হল। এই বিজয়ে বিস্মিত হয়ে গেল আওয়ামীলীগ জোট এবং ভারতের চাণক্যরা। তাদের নিশ্চিত বিজয় বিএনপি জোট এভাবে ছিনিয়ে নিতে পারে সেটা তাদের জন্য ছিল কল্পনাতীত। এই অপ্রত্যাশিত পরাজয় কিছুতেই মেনে নিতে পারছিলেন না আওয়ামীলীগ নেত্রী শেখ হাসিনা। এরশাদের সমর্থনও ছিল সুনিশ্চিত। তারপরও ভরাডুবি হল কি করে আওয়ামীলীগের! সেটাই ভাবিয়ে তুলেছিল ভারতকে। অফিসিয়াল রেজাল্ট বের হবার আগেই হাসিনা এক প্রেস কনফারেন্সে হাস্যকর অভিযোগ তুললেন নির্বাচনে ‘সূক্ষ্ম কারচুপি’ হয়েছে। কিন্তু তার অভিযোগ ধোপে টিকল না। তখন প্রতিহিংসা পরায়ণ হাসিনা ঘোষণা দিলেন সরকারকে এক মুহূর্তের জন্যও শান্তিতে থাকতে দেয়া হবে না। গণতান্ত্রিক মানসিকতার এক বিচিত্র বহিঃপ্রকাশ! I was posred at Nairobi as the High Commissioner when the anti Ershad movement started. In addition of my responsibilities as the High Commissioner I was assigned additional responsibility to look after the contingents of the armed forces of Bangladesh which were deployed for UN Peace Keeping or Peace Making Missions in different African countries. Thus it became easy for me to maintain continuous contact with the senior officers of the armed forces at the headquarters holding important posts and members of the contingents coming from Bangladesh. In view of the above, I could know many secrets about the current situation, on going political flow of events and the overt and covert reaction among the ranks and files of the armed forces from the individuals who were well known to me and I could trust. After analyzing all the information gathered from different sources one thing became evidently clear that centering around the people’s movement against the dictatorial regime of Gen. Ershad to regain democratic rights India supported by soviet Union is hatching up a deep conspiracy through RAW so that it can materialize the blue print sooner than later. The country is being pushed towards a civil war. Before being strangulated into slavery loosing self identity something needs to be done. I was unable to figure out being in exile what was possible for us to do at this cross road to counter the critical deep rooted conspiracy!The gravity of the situation was discussed with other comrades. All had opined that it should be me to take the initiative to do if at all anything is possible in this regard. The reason being it is only me who have the opportunity to know better about the ground realities and day to day developments. I decided to discuss the issue with my long time tested friend more than a brother, Gholam Rabbani Khan. Rabbani proffessionaly is a banker. After completing his studies he started his banking carrier joining Habib bank as an officer. There after, on his merit and hard work he climed the ladder serving in many well known and reputed international banks holding high ranking executive posts abroad for long period of time. At last he had established a bank of his own at Nairobi named Export Bank Of Africa. Due to his vision, working accuman, matured experience and honesty within a very short time the bank emerged as an institution with enormous potentialities and prospect. Very quickly Export Bank Of Africa earned the capacity to open branches in number of countries in Africa. As an inheritor of an aristrocatic family, true believer, honest and humanist friend of the deprived poor his left behind imprints could easily be found in every country where he had worked. Extremely humble, modest, cordial, selfless, benevolent to the lesser fortunates caught my imagination and I had liked him at the first sight. With the passage of time the friendship developed as all weather dependable family friendship. Rabbani though was a banker his keen observation, insight, analytical prowess about the philosophy of life, world politics, on going socio-economic trend around the Globe, the mind set and aggressive activities of the powerful countries, miserable plight of the Muslim world and the degradation of the kings, Sheikhs and Amirs astounded me! He was equally conscious about imperialist exploitation world wide and their lackies the ruling vested interested cotaries in most of the countries repression, persecution, deprivation. This had streanthened our friendship rock solid being rubbed on the streak of time traveling together through many ups and downs. Having blood connection with well known and revered Sufi family of Kaliya Sharif in the sub-continent Rabbani Khan was equally enlightened spiritually and thus all in all he was a rare soul. Particularly in the present erra it is hard to find a jem of a person like Rabbani Khan. He was also well connected with many influential people in the corridors of power in many powerfull countries of the world. But Rabbani hated althrough to take any advantage of his friendship and aquentence to gain any personal benefits or gains. This is also an unique character trait. Rabbani’s father was a Pathan and was an officer in the British civil service. After the inception of Pakistan he joined the Foreign Service and had accomplished his responsibilities in many countries with distinction. Both of us were equally concered about the future of the South Asia. Regional politics, uneven socio-economic condition, the nefarious evil intension and design of the Indian Chanakyas towards its smaller neighbors were matter of grave concern to us. We were particularly alermed and horrified about the unfair, discriminate dispensation of the ruling elites of so called secularist India to the minorities, Muslims in particular. In view of this, we were also worried thinking what might be the future of the entire Muslim population in this region. In this backdrop, both together always tried to make humble contribution within our means for the cause of the oppressed and down trodden vast majority people of this regeion along side executing our proffetional responsibilities. We always remained alive to the resistance struggle of different nations across the Globe against the aggretion and armed intervention by the Neo-impirialist powers. At this grave crutial juncture it wouldn’t be right to remain inactive brother, we must try to find a way out putting our best efforts to save Bangladesh from this conspiracy. Perhaps, it might be possible to find out a way out for extricating Bangladesh from the present disastrous crisis holding talks with Khaleda Zia and Gen. Ershad. I can try that. On my return, I shall be trying to get in touch with Khaleda Zia. I shall go with you to see if at all you can manage to establish any contact with her or not. Okay, lets go and see what happens. meanwhile I had decided that I shall try to contact her with a pseudo name to maintain secrecy of my self identity. It was also decided that I shall take the name of Mohammad and shall be using different numbers other than my official or residence numbers. I shall also tell her to keep me informed about her changed contact numbers and timings so that I can talk with her as and when required. Please wait for a while, I would let you know the decision of Madame. You please call her right now taking the name ‘Mohmmad’ as she is waiting for your call. With the number given by Shapan our contact had started. Mobiles were not introduced at that time. I could get connected very first time I dialed that number. Hallo, who was speaking from where? A male voice was at the other end. I am Mohammad speaking from abroad. Oh! Okay, please hold on, I am handing over the receiver. Assalamaikum, this is khaleda speaking. Walaikuamassalam, Bhabi how are you? Bhabi, I would like to clarify one thing right at the begining. I am not used to talk in a round about way to pleasing any one. I am used to straight talk so, I must know whether even after knowing that would you would be interested to talk to me or not. You can be at ease to talk to me freely as you like. The programe was declared after discussing with allied parties anonymously . May I know, what you and your allies had thought could be the consiquences? Our presumption is that if we can bring in waves of people from across the country to siege the cantonment then it would be possible to force Ershad to resign as the President under pressure, at the same time after fall of his regime national election could be held. The analysis is nothing but a day dream. Why do you say that? Is your analysis different than ours? Then say, I am interested to know. My analysis is based on informations that I could gather from various sources. It wouldn’t be so easy to fulfill your desire. In the history of human civilization no where you would find that it had been possible to over throw any dictator only with meetings, marches and puplic gatherings. At present Gen. Ershad as the elected President constiruionaly a powerful nan. He has already been able to placed his henchmen from top to bottom in the armed forces, police, all other law enforcing forces, agencies and administration. Centaring around Gen. Zia’s killing and all the follow up events the then stooge of India the major pawn had played a cunning game with the support of Awami League is Gen. Ershad who had been successfully managed to usurp the state power. There is no scope to think that he would abdicate himself from power under pressure of the peoople’s gathering. He still holds the Ace of the cards in his hand. He is already preparing to play that. Did you have any clue about that? No, would you elaborate on that please. I believe, he would play his ace in the back drop of your this call. Please make me understand what kind of game he is going to play? Why are you taking Gen. Ershad to be so naïve? He is sly as a fox and a camilion. He is well informed and monitoring every move that you are contemplating to take. He has already established an Ops Room in Banga Bhaban. He is not only depending the local intelligence agencies, gen. Ershad is vetting every information after discussing with RAW, KGB and AWAMI BAKSHALITES. In this way decision of his each move is being taken. He would nip in the bud all your efforts to bring streams of people from across the country for the siege of the cantonment by promulgating Nartial Law in the country. At the same time he would unleash ruthless state terrorism and target killing. As a result, a civil war would become a factual reality. You ally Hasina and her party wouldn’t be the target of state terrorism and target killing the target would be you and the selective tested freedom fighters, those who believe in religious values and genuinely anti Indian nationalists leaders and workers. In this game plan if at all the situation goes out of control then Gen. Ershad would call in the Indian armed forces under the ‘25 years treaty of friendship’ which still remains operative. With the intervention of Indian forces within no time your movement would be muted. The ordinary peace loving people would feel a sigh of relief and might as well welcome the Indian intervention with the tacit support of Awami League. There after Gen. Ershad’s utility would be finished just like Gen. Zia after he brought back Hasina and rehabilitated Awami League in the national politics. Neo-BAKSHALITES under the leadership of Hasina would be brought into power replacing Gen. Ershad. As the uncompromising ‘Non comromizing leader of the Country’(Desh Netri) what would you do? Would you then find another Kalur Ghat to give a clarion call, “ I, the Desh Netri Khaleda Zia is speaking……”! I said that humorously to lighten the atmosphere in humor. Khaleda Zia was dumb founded. So, just to acertain if she was still on line I asked Bhabi are you there? yes I am listning, You please continue. Not to make you wiser but I think the present scenario has some similarity with 16th December’71. How much you are aware of that I am not sure that’s why I am saying. On 16th December violating the greement with the surrener of the Pakistani armed forces under Gen Niazi’s surrender to Indian Gen. Arora the valor and gallantry of the freedom fighters withered away. At the provitional government’s order the vanguard freedom fighters were not allowed to enter any city or town and they were asked to remain in the deserted forests and hilly areas along the border!The order was issued that all the commanders of Mukti Fauj should take back the arms and tell the freedom fighters that the country has become independent so their job is also finished. Order included to give them Rs. 50 each and to say well done and good bye patting on their back! On the other hand, all over the country Indian forces swarmed in. Along side, uncountable armed members of Awami youth League(Jubo League), Student League(Chatro League), Labor League(Sromik League), Kaderiya Bahini, Volunteer League(Shecha Sebak League and party hooligans and different privet Bahinies of influential leaders with sporting bands of different colors around their heads in frenzied mood celebrating independence. Most of them belonged to the political force called BLF later named Mujib Bahini created by RAW during liberation war to counter the freedom fighters. Just before the fall of Dhaka these trained armed goons were sent inside to act as ally to the Indian armed forces for facilitating their wanton loot and plunder. Comparatively they can be equted with ‘Al Badars’ and ‘Al Shams’ ‘Razakars’ raised by RAW and Indian armed forces. Thus hijacking all credits of the war of independence the looters and plunderers the Indian armed forces emerged to be the victorious heros all over the country. The male and female populous of the country warmly welcomed them showering flower petals. Of course it din’t take long to get their real face to get unmasked before the countrymen. People could catch the bluff of the Indian Chanakyas and their installed despotic government. That is why they named them as ’16 Division’. Though the freedom fighters were not fortunate to be greeted with showering flower petals were not spared as as they were vocal and tried in every way to resist such out right loot and plunder of the national assests from the red eyes of the government, terror and persecution of the different Bahinis of the ruling party during the autocratic rule of Sheikh Mujib and his facist regime of AWAMI-BAKSHAL. in power shrouded with the cloak of democracy. The country would become a spinless client state and the nation loosing its self identity would be enslaved for indefinite period of time. The independence would mean having only a national flag and a national anthem which has been written by an Indian poet who is also the writter of Indian national anthem. Though, might be an dubious coincidence but there is no such example could be found in the world. History says that in the 3ed world it is very easy for any ruler to creat some gimic to enhace self image and justify that with wide publicity but to make it ever lasting is impossible. Most of those who goes to power in the 3ed world countries can not realize this reality because of colonial heritage. When if at all it is realized then they don’t get enough time and opportunity to rectify. Take the example of your late husband Gen. Zia. During his 48 hours state visit along with you to PRC, he spent 8/9 hours holding exclusive meeting with me. During the meeting he frankly confessed that he had realized his mistakes and told me to forget and forgive everything of the past and desired to do politics together in presence of my late father. With out going into any controversy I sincerely only told him that considering all aspects it was not a practical proposition. Because, the water by then had flown down the river far away. All that we have conferred and follow up events are known to you. I think in the power politics major political players at the national level hardly care to take any lesson from history and thus history repeats itself. In that process what would be your or Gen. Ershad’s fate would be as an indivisual that is hard to say. But it is not difficult to feel that the end would not be pleasant. Of course, it is not a matter of any concern to us what happens to any individual. But as a result of the self defeating power struggle, the catastrophic disaster that the country and the nation would suffer for that you would have to share the responsibility equally with others. The verdict of history is very cruel! In the streak plate of history there is no scope to escape from any action good or bad being rubbed to establish the truth. That is why it is said history never forgives any one. It is said that all of us had fled from the country on the 4th November, after the reactionary coup de’tat staged by Brig. Khaled Mosharraf. This is what is being propagated from different quarters though both Khaled Bhabi and Huda bhabi had travelled with us upto Bangkok. Would it be wrong to say that the silence of the opposition and the Jote is a tacit support to this falsehood? Please do not think that I am trying to embarrass you. No, I am not thinking anything like that, I am listning with due importance to everything that you are saying. But brother is there any other alternative to finish the oppression under the steam rollar of the dictatorial regime? Is there any way to remove the dictator at the same time the country and the nation can be saved from the malecious conspiracy? If you can defer your action plan to siege the cantonment then I can try that Gen. Ershad can declare Martial Law in the country and is forced to resign under pressure. But I have one condition. All compromizes are based on give and take. Therefore, after resigning if he wants to leave the country with his family that should be agreeable to you. He might also decide not to leave the country. In that case, it would be very easy for you to but him behind the bars. Personaly, I would prefer he leaves the country, as I know his decision would be as dictated by India keeping in mind to use him in future. All right, accepting your condition I am giving my words after resigning if he wants to leave the country with his family then it would be my responsibility to send him out along with his family. Okey then, I am going to start working on whatever is needed to be done taking all the risks. But you must promise that everything regarding this issue should be confined just between two of us. No other third party should not know anything, not even your relatives or close advisors. Well then allow me to call it a day now. I shall contact you again when required. Trusting you, I am going to call off the programe of encirlement keeping it in abyence. I would be anxiously waiting to know the up dates from you. Feel free to contact me at your convenience any time in day or at night. You would be informed about my where about if and when changed. Thanks, I dropped the line. I apprised Rabbani who was sitting next to me the gist of our conversation and had taken the decision regarding what should be done next. Information of Gen. Ershad’s decision to promulgate Martial Law has already been received. Now it needs to be known what would be his tactics in this regard. After two days I received a wireless messege that the government has requested the UN to send back on priority basis Brig. Salam, commander of Bangladesh contingent in Senigol. Further more, I came to know that Gen. Ershad the President had decided to promote Salam and appoint him as the CGS at the advise of Gen. Nuruddin the Army Chief. This was a positive news. I had worked togather at the Comilla Brigade. Though salam hailed from a middle class family and was a repatriated officer, he was a true Imandar nationalist heart and soul. The poor chap inspite of several attempts was unable to escape from West Pakistan to join the liberation war. On return to the country after knowing the long drawn blue print of India regarding Bangladesh he became furiously anti Indian and AWAMI-BAKSHALITES. As a result, he became a trusted friend. I also learned he had received the release order from the UN Headquarters. But he was not informed where and in what post he would be appointed. I gave him the good news and warmly congratulated him. It had been decided that after going back he would be appointed as the CGS on promotion. As the news is still a secret at Dhaka I told him not to disclose this information to any one. At the same time I told him this time on his way back he would not be staying at the hotel on transit but at my residence as I have some important matters to discuss with him. I didn’t have to tell any thing more to Salam. In reply Salam said that he would try to reach Nairobi as soon as possible. Knowing the news of his promotion, he happily uttered Subhan Allah! Shortly, Salam arrived. On the first night after dinner we both sat down to have exclusive conversation. Sir, tell me what is happening in the country? Lots of news are coming out in the Media, but what are the facts? To assassinate Gen. Zia and uproot all the patriotic and freedom fighter officers and members of the armed forces. They have achieved both these objectives so, Gen. Ershad is no longer required as the main player. Now, they want Hasina in power. At present in the on going anti Ershad movement India also has a hand and that is why Awami League has also joined the movement along with Khaleda Zia. During this movement at one point of time Khaleda would be taken care of and Awami League would be brought to power. If India some how manage to install AWAMI-BAKSHALITES once again in power then the country would become a client state and we would becom slaves for indefinite period of time. In such a situation, it is no more possible for us to do anything playing the vanguard role with depleted strength. But we strongly believe that all those who still exist in the armed forces particularly in the arny like you certainly can take a stand against this conspiracy. In that case, we can make all out efforts to contribute as your allies. Sir, please elaborate a bit more what is needed to be done practically in the context of ground realities. I became inspired. The anti Ershad movement had reached to a flash point. The government machinaries are tottering. The country as a whole has become stand still. At this back drop India now pressurizing Ershad to promulgate Martial Law in the country. Because at a such explosive situation if Gen. Ershad promulgate Martial Law the situation would go out of his control which would force bewildered Ershad would invite the the Indian armed forces for intervension in our internal affairs under the ’25 years of Mujib-Indira treaty of friendship’ to save himself from the pierre fire caused by the thrusted civil war. Having that opportunity the Chanakays would move in as the savior and after entrenching themselves firmly on the soil of Bangladesh would install their chosen NEO-BAKSHAL government in power under Hasina. Thus they would regain their lost heaven. The people’s movement would go down the river. Salam, can this abhorsive conspiracy be accepted? Certainly not Sir, but how can we counter such a conspiracy? This could be discussed later. At first we have to decide whethere we are prepared to work togather with clomplete trust and sincerity to save the country and the nation from such a hinious conspiracy or not. I am letting you know that for the greater interest I am prepared to work with you all united as one with my heart and soul. You can trust me, Sir. I had the opportunity to closely observe you all. You all are tested patriots. You are above all wants and gains. I had always adored all of you at my heart though, never had the opportunity to express myself, thinking even in today’s world how anyone could be so selfless! I am certain that you along with your other couleagues must have formulated some plan like resolving many crysis in the past. If you trust me and give any assignment then I shall try my best to fullfil that regardless what might be the consequences. As the newly appointed CGS if you hold an Unit Commander’s conference to get introduced you would be able to know their feelings on the ground. In that conference you would be able to acertain the truth of my sayings and factual realities. As it is customary, after the Ordinace is issued to promulgate the Martial Law the order would reach at the AHQ for its implementation at that moment, you have to launch a Blitz Krieg operation to place President Ershad and his cohorts under house arrest and sever all the means to contact any one outside. You should also make sure that they can’t even contact with each other. Thereafter, you would be the defacto Chief. I am in touch with Khaleda Zia. You would also be provided with the list of those sly foxes shrouded with sheep skin nurtured by India in the political arena. You have to put them all under house arrest quickly with out giving any reaction time. You would also be provided authentic information regarding which criminal charges should be brought against whom. Your move would be fully supported politically by Khaleda Zia being the supreme leader of the on going movement. Within the armed forces you would get full support from the Sena Parisad and all other patriotic officers and soldiers. There after, I shall secure the withdrawal of warrant of arrest issued against the two leaders Khaleda Zia and Hasina Wajed negotiating with Gen. Ershad. He would resign under pressure handing over power to the Chief Justice. At the same time he would also announce that fresh elections would be held in the country sooner than later. There after, if he decides to leave the country with his family that would be allowed. I have already come to an understanding with Khaleda Zia on this issue. On my suggestion she had also agreed to call off her action programe temporarily to siege the cantonment keeping that in abeyance. All these are very sensitive matters so, these secrets have to be maintained very carefully brother. I have not informed Khaleda Zia anything about what is going to happen within the armed forces for the sake of secrecy. But Sir, you have not said anything about the Chief. Gen. Nuruddin being one of the confidant of Gen. Ershad, how it would be possible for me to execute my responsibilities remaing under his command? It would be possible, keeping Gen. Nuruddin as the Chief. The reason being that Gen. Nuruddin is an ambitious person but very coward at heart. When the conspiracy to kill Gen. Zia he with the intension of fullfiling his ambition had met Hasinato pledge his loyality. At that time he was advised to go along with Gen. Ershad. As a result he had a vital role in Gen. Zia’s killing, Gen. Manjur’s murder and hanging the freedom fighter officers through a camera trial as instructed by Gen. Ershad. But after the election in 1986, when Hasina’s Awami League and Jamaat resigned from the Parliament and joined back the anti Ershad movement abandoning Gen. Ershad, Gen. Nuruddin from then became nervous thinking about his future realizing that Gen. Ershad’s days were numbered. Since then he is on the look out for some one to save his soul. You have to use this weakness. You have to convince him that if he goes along with you as advised then no harm would be caused to him in future. He would take your bate to accept you to be his savior having no other alternative. In that case you would be able to execute everything keeping him in front your. Thus, it would not be possible to hold you responsible for anything. At the same time being the root you would remain safe. This is how the snake would be killed but the stick would remain intact. Being a patriot and hero you would remain above any controversity. As you are intelligent enough you would be able to play your role successfully with out much difficulties, I can vouch for that. If you can fullfil your assigned responsibilities for the greater interest then Your name would be written in golden letters in the history of Bangladesh. Besides, on the day of final judgement here after Allah shall certainly rewarded you for being a truly man of faith. It is a difficult responsinility but not impossible. Allah’s blessings always befall on those who fight for justice and peace not the unjust oppressors. You nust take your time to ponder cooly upon what I have said and after doing so let me know whether you are prepared to take on the assigned responsibilities or not before your departure. Sir, I shall fullfil my responsibilities. I am glad. to day you have proven yourself much more than what we had been thinking about you. But you have to move very carefully. Each secision has to be prudent. Salam left. Immediately on return Salam was posted as the CGS. I could learn after going back Salam could find the similarity of the ground realities with whatever I had said, and was moving ahead as planned. Had had also been able to take Gen. Nuruddin into his fold quite easily. The President had become desperate to retain his power. He was holding close door meetings after meetings with his confidants at the Banga Bhaban and C-in-C’s secretariates formulating the blue print about promulgation of Martial Law. The Chief was scarcely available at the AHQ(Sena Sadar). Salam was taking full advantage of his absence and completing all his preparations that were needed. Gen. Salam meanwhile, had already held the formation and unit Commander’s conferences and visited all the cantonments to gather first hand information about the feeling and reaction of the officers and soldiers. I was further informed that Gen. Salam got convinced that most of the members of the armed forces in every cantonment were against the promulgation of Martial Law in the country. They don’t want to stand against the people just to keep in power the most hated dictator in the eyes of the people. They are now considering Gen. Ershad as nothing but a liability for the armed forces and an Indian agent. I also came to know that prevailing ground realities had immensly enhanced Gen. Salam’s self confidence. These all were welcoming news! Now, I have to request Begum Khaleda Zia to spread the words in the country of course, not formally that she is going to give the call any day to siege Dhaka cantonment. This warning should be widely publisized in the country without taking into cognigence of her ally Sheikh Hasina’s reaction. Being threatened with such a country wide well publicised warning unnerved President Gen. Ershad would decide to promulgate Martial Law and subsiquently the Chief would issue order to deploy the troops. Right at that time Gen. Salam would start executing his responsibilities. Untill Gen. Ershad abdicates Gen. Salam would be ensuring the chain of command as the defecto Chief. Till the time Gen. Ershad hands over power no statement would be issued from the AHQ through ISPR. Media would also be kept at bay. People should be absolutely in dark about the whole episode so that no one can react. Both of them should also not meet any diplomat at any level. People should be absolutely in dark about the whole episode so that no one can react. Both of them should also not meet any diplomat at any level. Brig. Hannan Shah, Obaidur Rahman, Barrister Nazmul Huda would be put to house arrest. None of them would be allowed to contact the Media, any one from the diplomatic enclave or any party leader and worker. Telephone connections of all those would be severed. BDR would be ordered to seal and highten their vigilance at the border. Particularly, Kader Siddiqi would be placed under strict sarvellence. Once all these actions are complete, I shall personally get in touch with Gen. Ershad and through negotiation would secure the Preasidential Order to withdraw arrest warrents against both the leaders Khaleda Zia and Sheikh Hasina and compel him to resign. While negotiating with Ershad I must also maintain uninturrupted contact with Khaleda Zia. Salam is the main person behind everything that would be kept secret so that being a selfless patriot his life and carrier is not affected. Due to his patriotism and courage we would be able to save the country and the nation from the present conspiracy In Sha Allah! I was overwhelmed immotionally! Inspite of all that had happened in the armed forces that we had raised, patriotism and nationalism which was the spirit of ’71 is not lost totally yet due to the mercy of Allah! All through, my shadow companion Rabbani Khan remained as a keen obsever and quite listener looked dazed abd surprised! He might have been trying to assimilate amazingly the developments that had been evolving rapidly. Why are you proposing this, I can not understand? You would be getting the reply from whatever happens within a few days. Right at this moment I am unable to disclose anything more. Besides, we have to restrict our conversation strictly on ‘Need to Know basis’ for some time from now. However, I can tell you this much that whatever might happen that would be in the interst of you, country and the nation In Sha Allah! The snake would be killed but the stick would remain intact. Okay, I am taking necessary steps complying with your request. Thanks a lot, I dropped the line. There after everything was moving speedily. As a loyal officer to save the life of the President and all his close confidants there was no other alternative but to take them into protective custody. Because, if the order to promulgate Martial Law in the country would have been implemented than the whole of the armed forces would have exploded in revolt and the entire nation would have been engulfed in a preirre fire. The officers and the soldiers of the patriotic armed forces are deadly against the Martial Law. Not only that, they are not willing to take up arms against the fellow countrymen for a hated President. Most of them consider that Gen. Ershad is nothing but a liability for the armed forces. The country takes precedence over any individual so, it would be prudent for the President not to plunge the country in fire but to resign and hand over power announcing fresh general elections forthwith as demaned by the people. If that is not done then all of us would be burned to ashes in that explosion. Mr. President Sir, you have to stand down from power. As planned. Now your responsibility would be to give a call to the nation to enshure normalcy and law and order in the country. There should not be any hinderence in people’s day to day life and all must keep their cool. There are some practical difficulties to get in touch with Gen. Ershad from here so, I shall be leaving for London incognito within a few days. On arrival I shall make sure that Gen. Ershad withdraw the warrant of arrest against both of you. This would allow you and other leaders to come out from underground and openly keep the situation under comtrol through mass contacts. After your arrest warrents are withdrawn I shall initiate the negotiation with him about his resignation. I shall remain in touch with the armed forces and you while negotiating with Gen. Ershad. You would be apprised about the developments and the result in this regard. If you allow, I shall be off now as I need to attend to a few important matters before my departure. Allah Hafez. After the crash action Shafiqul Gahni Shapan called being very concerned. He had no clue what so ever that such an event could take place. Dalim Bhai, do you know or have any guess who all could take such a drastic measure? How could I possibly know brother? I was rather thinking to call you. You are not a well reputed journalist but being the son of Jadu Mia also an established BNP leader. Other than this you are also related to Gen. Ershad. In this case who else could know better than you what is happening! I could sense Shapan was slightly embarrassed. All the more, you are one of the confidants of Khaleda Zia so, I thought I would be able to know the most authentic information from you. What about Mohiuddin Bhai and Mukti Api in New York Mission, are they also in dark as we all are? None in the country or outside knows what is happening, everybody is in the dark! But I have a request, if possible please try so that no physical harm is done to them. Mohiuddin Bhai, Mukti Api, Babu, Leli are phoning me from New York and London. They are shattered completely with fear and apprehension. They might call you as well. This armed forces are raised by you that is why this request, hope you woun’t mind for my this request? There is nothing to mind. But you know what Shapan, the armed forces that we had raised the character of that has been erroded to great extent over the time. Ideals and moral values have been changed. Even then, if there is any scope then be rest assured that I shall try to do my best. Soon after I finished talking with Shapan, Babu and Neli called from London. When I was posted in Hongkong Babu was working with BCCI bank there. That is how we came to know each other. We liked Babu and Neli both at the first sight. Both of them were very simple and open hearted. The couple had no pride being colsely related with the President. They used to seek our advise almost on every thing they did. Both Nimmi and me were well respected by both Babu and Neli. They used to love us from the core of their hearts. I had known Daisy Bhabi that is Begum Ershad from Pakistan days. She was widely known as Saisy Bhabi rather than Rawshan Vhabi. She was quite and soft spolen but always very affectionate and hospitable to the young officers. On the other hand then Maj. Ershad. was sporty and a very romantic person. His weakness towards the three Ws(Wealth-Women-Wine)was well known. When I was in China Saisy Bhabi was under treatment there over three months. Then it was me and Nimmi used to look after her. That brought us closer to her and we could understand her better and started liking her more. She also very affectionately loved both of us like near ones. Babu and Neli both were crying and repeatedly were requesting me to get both Gen. Ershad and Daisy Bhabi from the country if possible through my contacts within the army. I and Nimmi tried to console them saying that there would be no darth of sincereity to try whatever is possible. At such assurance both Babu and Neli totally broken were slightly relieved. After talking with Babu and Neli I called Gen. Ershad. All time companion was sitting next to me with a note pad in hand. He is a very meticulous person. Rabbani is an extremely intelligent person with unbelievable photogenic memory. He is a very meticulous person. Rabbani is an extremely intelligent person with unbelievable photogenic memory. Assalamalaikum Sir, How are you? Sudden unexpected call from me surprised Gen. Ershad. Walaikum Assalam, Dalim where from? How could uou contacted me? The reply to this is immaterial. You had almost driven the country towards a dreadful disaster. Why you decided to declare Martial Law in the country just to cling to power? For that outrageous decision today you and your confidants are all under house arrest. The whole nation to day had risen up against your long eight years of dictatorship. In view of the above majority members of the patriotic armed forces had decided to stand against your self defeating decision to save the nation from a civil war. This is not the time to elaborate what could be the consequences of you and your cohorts in that civil war. But I would very humbly want to submit a factual ground reality to you. The vast majority of the people have hailed this sudden unexpected action of the armed forces. They are now anxiously waiting to see what is next! At this crucial juncture being driven by my concious I have taken the initiative to call you to find a way out from this impass managing all sides and your personal fate in particular. Meanwhile, Shapan from Dhaka and Babu and Neli from London have already called me. They are completely devasteted and very much concerned about the safty of you and Daisy Bhabi. Considering me one of their close one had requested to do if anything is possible for me to do. Okay, tell me what kind of cooperation do you want from me. Whatever I am going to tell, you have to consider that not with your immotion but prudence. I shall be doing that. First of all, tell me if you are facing any particular difficulty or not? How is Daisy Bhabi? Daisy is okay. I have no other difficulty other than confinement. We are kept in a normal condition except there is no scope for me to contact any one. This is the rule of business that is well known to you Sir. Now, listen to me carefully. I had talked to Khaleda Zia. On my request she has agreed to postpond her call to siege Dhaka cantonment and kept that in abayance though Hasina is vehemently opposing this decision of her. It should not be very difficult for you to understand as to why she is doing so. In my consideration, you have only one way out. Temporary retreat. Should you decide to resign at will dissolving Parliament and announce fresh elections then if you desire to leave the country with your family then Khaleda Zia has promised to arrange a safe passage for you to leave the country and army would also accept that. I know Hasina would not accept this decision easily. Not only that she is already becoming more vocal to send you to Jail and face trial so that you remain at her mercy to be used to fullfil her and India’s interest. You have to accept one truth Sir, you do not count much anymore to India. Whatever India wanted to achieve that they have already acieved keeping you in power for long eight years. From now Hasina would be at the driving seat and you habe to remain as her henchman. Gen. Zia had also compromised with India. Soon after he rehabilitated AWAMI-BAKSHALITES under the leadership of Hasina in the main stream of national politics his utility also finished. As a result, what was the consequence that you are well aware of being a major player at that time. After 15th August and 7th November for resurrection of nearly extinct AWAMI-BAKSHALITES both Gen. Zia and you had been used by India as you had adopted an anti national policy to compromise with India. My earnest request, should you refrain from providing any opportunity to Awami League for political point scoring then your past mistakes would be redeemed at least to some extent. Sir, politics of compromise just for power sake is very complicated and awafully cruel. You are telling the truth. Has Madamn realy agreed to arrange a safe passage for me to leave the country as a free man? Now, I must be leaving for London as soon as possible. Due to long association he can get the gist of everything what we talk even in Bangla. Rabbani, I don’t know what impression you got reading Gen. Ershad’s face during his Kenya visit. He looks very innocent but he is not. He is very slippery person. It doesn’t take a moment for Gen. Ershad to change his mind. When he was the CMLA, then everybody used to say CMLA means- Cancel My Last Announcement! Having said that both of us burst into laughter. Dost(Friend), more I see, I find you more amazing! I have seen many accomplished Ambassadors and High Commissioners known as ‘Tigers’. I have seen how they behave with the Prime Ministers or the Presidents. I have also seen you during President Gen. Ershad’s visit. I have found all of them sweating hel out during any VVIP visit due to tension and I have noticed you closely as well during the sate visit of Gen. Ershad remaining normal as always! Now, I am witnessing, how a man is turning the game of dice other way round from thousands of miles away so easily! How do you get such self confidence and courage? Dear friend, if the cause is right and not self centered but for the greater interst then Allah, the most mercyfull provides the required self confidence and courrage. This I have experienced in my own life. After Rabbani had left some thoughts were still hovering in my mind. Mostly, Gen. Ershad’s words do not match with his deeds so, there is no scpoe to be over enthusiastic. I have to be cautious talking with Khaleda Zia and AHQ while negotiating with Gen. Ershad. Next day night I called Gen. Ershad again. Rabbani was sitting beside me. Assalam, how are you doing to day Sir? What have you thought? Sir, if you don’t mind I would like to say onething openly. This is of course entirely my own consideration. Tell me, what do you want to say. I have no doubt that whatever you would be saying as a true well wisher would be for our good. Sir, saving yourself do leave the country with the family and come out. As I hear, your worth already has become around 600 Million Dollars. The money is laying in different bank accounts abroad. If the amount is even half of that with that kind of money it wouldn’t be difficult at all for you to lead a luxurious life any where in the world. Besides, in most of the 3ed world country the way uncertinity prevails in politics it is very much possible to get the opportunity to stage back any time. Babu and all other near ones also think alike. It is happening all around. You might be able to digest the food in the Jail even at this age. But as I am aware of her health condition, I can vouch that she would find it very difficult to withstand the pressure mentally and physically. Moreover, if you do not follow the dectats of the forein masters then the matter may not remain restricted only up to imprisonment. In that case, the situation might go out of hands, you know what I mean Sir. You are right, I agree with your proposal. In that case, can I communicate your decision to Madame? Sir, make sure that you would not go back on your decision. I take the liberty to say that as you do not enjoy a good reputation in this regard. Should you go along with your reputation in this case then it wouldn’t be possible for me to do anything more. Therefore, I am asking you again, is it your firm decision after due deliberation? Every one is not Dalim. Well then, let me inform Madame about your decision. I shall also ask her what they have decided about the exact modalities of resignation, transfer of power and declaration of future election as we have to proceed accordingly. You also think about these issues. The way out shall have to be found based on the thoughts of both sides. What do you think Sir? To whom President Ershad would be transfering power? I shall let you know the final decision in thid regard after consulting among ourselves within a day or two, said Khaleda Zia. I think sooner would be better because, it would not be correct to allow Gen. Ershad any time and opportunity to change his decision. One more thing you must keep in mind. Though, Gen. Ershad has decided to leave the country but, in this regard India and RAW would have the last say. I am sure, you can understand why. Your important indications would be at the back of my mind. In view of that we shall finalize the decision as soon as possible In Sha Allah. I shall be waiting for your call. Tanks. Khaleda Zia dropped the line. Gist of all these conversations were conveyed to the particular person who then mattered the most at the AHQ. Negotiation is on and there is nothing to worry about. Bhai-Bhabi both are fine. I am in touch with people from all sides. The crisis would be over soon In Sha Allah. You also pray so that they can come out from the country hail and hearty. Next day Khaleda Zia informed that President Ershad has to hand over power to the Chief Justice. When informed Gen. Ershad agreed. His address to the nation was recorded. In his short speech he informed the nation about his decision to resign, withdrawal of the warrants of arrest against the two leaders and handing over power to the Chief Justice to hold the next general elections. With the broad cast of his speech the whole nation burst into juvilation. The entire nation was happy with his such decisions. This is how the country and nation got saved from a suicidal disaster! Once again the conspiracy of the Chanakyas got foiled due to the infinite mercy of Allah. Both me and Rabbai had a sigh of relief! The General, the key player remained unknown! Even after all that I could not be completely tension free. Though, Gen. Ershad beibg cunning like a fox had decided to resign and leave the country for his personal safety but would his foreign master India allow to leave him so easily? This apprehension was bothering me the most. Till Gen. Ershad do not leave the country, this apprehension would remain as a matter of concern. Any way, after his speech was broadcasted in the national Media I called him again to discuss about his departure from the country in presence of Rabbai. Assalam Sir, how are you doing? For the greater interest of the country and the naion the sacrifice that you had made is praise worthy. I am conveying my sincere gratitude from the core of my heart. Now, tell me when are you leaving the country? All arrangements would be done according to your decision. I shall not leave the country. Winning the elections I shall be forming the government again. I would be wining about 150 seats. I was shocked! What nonsense Gen. Ershad is taking about! My apprehension became true. The game is still not over. But what was that? In the future elections there would be no scope for rigging. Because, the Chief Justice would ensure a free and fair elections acceptable to the international community with the help of the armed forces. In that case Gen. Ershad and his party would win 150 seats and form the government, an insane person would also not believe that! In view of this reality, the game would be as Hasina is lacking behind in popularity compared to Khaleda Zia, Gen. Ershad would be used to cut her votes and later Hasina would be forming the government securing the suppoet of Gen. Ershad if necessary. That is why their master India is not permitting Gen. Ershad to leave the country. In 1986, Gen. Ershad with the support of Awami League and Jamaat failed to legimitate his illigemitate rule through fraudulent elections. India played the major role behind that machination. The strings around the neck of Hasina and Ershad are in the hands of Indian Chanakyas. Jamaat’s politics had been wired right from the beginning. At first Maulana Moududi, the ideologue of Jammat in protest against ‘Two Nation’ theory did not accept Pakistan. Later, with the touch of some magic wand the Maulana migrated from India to Punjab, West Pakistan! After his Hijrat in early fifties he issued a ‘Fatwa’ declaring the Qadiyani sect as non Muslims. This ‘Fatwa’ triggered off a serious blood bath through out Pakistan, scores of people were killed and displaced in that carnage. Maulana was arrested and sentenced to death. But later somehow, he was aquited and released dubiously. Since then Jammat has been persuing pro-establishment politices, There are many evidences of this in the political process of Pakistan. After rehabilitating the Awami League under Sheikh Hasina through compromise with India, Gen. Zia had allowed Proff. Golam Azam to come back to Bangladesh as a balancing act. On his return Proff. Golam Azam took over as the Amir of Jammat e Islami Bangladesh and got engaged to reorganize the party. After the demise of Gen. Zia in the political process Jamaat did not protest Gen. ershad’s usurpation of power to curry favor. Later on, with the intention of getting acceptance from Awami League Jammat e Islami became the tail ender of Awami League and had participated in the elections of 1986. But even after their betryal Khaleda Zia remained stead fast not to participate in that election. The reason being she had a firm conviction that Gen. Ershad, Awami League and India were behind the premature death of her husband. For the same reason Khaleda Zia also decided not to provide legitimacy to Gen. Ershad’s taking over power on gun point outsting Justice Satter, the ailing elected President who was a BNP’s nominee but to lead the anti Ershad movement. Thus, she earned the immage of a ‘Non Compromising Leader’ in the eyes of the people. Similarly, her popularity had also enhanced to great extend. Politically this was an unexpected meallage. As a result, khaleda Zia could evolve as to be the main leader of the anti Ershad movement. As the anti Ershad movement was gaining streanth with every passing day at that time realizing that the fall of Ershad was imminent at the signal of Indian Chanakyas Awami League deserted Gen. Ershad and rejoined the anti Ershad movement and Jamaat also followed Awami League and sneaked back in anti Ershad movement. Although, both these parties received parronage in various ways from Gen. Ershad for participating in the elections of 1986. Whatever, it was not difficult to understand that considering the advantage of organizational weakness and resource constrains of BNP with the all out support from the Chanakya Puri(India) Awami League and Ershad combine were almost sure that they are going to form the government again after the next elections. People’s support were behind Khaleda Zia but as far as the loyal or impartial administration, money power, organizational streanth and muscle power Gen. Ershad and Awami League both were far ahead of Khaleda Zia. The result of any elections held in the 3ed world countries greatly depends on these four factors. Having ruled the country for long 8 years, Gen. Ershad and his ally Awami League had enough time to politisize the administration. Jamaat could also move ahead in this respect to some extent being the jounior partner. I became gravely concerned with this ominus sign! It is imperative to inform Khaleda Zia about Gen. Ershad’s changed decision, the significance of his statement and analysis openly so that Khaleda Zia could take appropriate measures to counter these challenges. What is the matter, what are you thinking so seriously? Listen, in this regard I have an analysis. After the elections in future not Ershad but Awami League will form the government, Gen. ershad would be a supporting ally of Awami League. Awami League and India would be using Jamaat to cut Khaleda’s votes but would never be given any share of power. There is more to say. After providing legitimacy to Gen. Ershad being the tail ender of Awami League their very survibal is threatened now. Therefore, for their survibal politically they have no other alternative but making an alliance with BNP. They would try their best to get into the electoral alliance of Khaleda Zia. BNP should accept them. I am confident, the scenario of the future elections would not be as 1986. At that time Jamaat was taken away to weaken the movement of BNP Jote. At the same time Jamaat was counted to provide legitimacy to Awami League’s participation in the elections and illegally usurpation of power by Gen. Ershad. In the future elections Jamaat would not be required by Awami League and Gen. Ershad. Because they have realized that still the acceptance of Jamaat to the common people remains questionable. This has been amply manifested in the results of the elections. The thing which is bothering me the most is that, If Awami League goes to power along with Ershad then BNP, the so called standard bearer of nationalism and the champion of Islamic values Jamaat would be wiped out from the main stream of politics in Bangladesh gradually. Both these two parties would get extinct with the passage of time. Consequentially, the country would be ruled by the NEO-BAKSHALITES. Your analysis has weight. In this context, it would be rational to get these two parties together. The leaders of both these parties need to be told to understand the present realities. Both the parties should forget all bitterness of the past to face the conspiracy centaring around the next elections unitedly utilizing the sky high popularity of Khaleda Zia. For such understanding assistance could be sought from the common friends. Yes, that can be done. But even then there remains a question. Lets take, both these parties are brought together even then would it be possible for this Jote which is organaizationally weak to defeat the more powerful opposition in all respect just banking on the popular support to Khaleda Zia? Brother, most of this popular support is from the silent majority. The strategy of Awami League and Gen. Ershad would be to creat such a situation with their money and muscle power that the silent majority can’t reach up to the polling centers taking the risk of their lives. In that situation, would this popularity be able to show any stunning result as expected? Very logical question. That is why the Election Commission must ensure to provide adequet security to the voters so that they can reach up to the polling booths for casting votes with out any fear. For this armed forces should be deployed in every polling booth. For free and fair elections this demand must be raised forcefully with the Election Commission by Khaleda Zia. In the present situation, there would be no opposition against such a demand at home or abroad. This would not be taken positively by Awami League, Gen Ershad and their master India. But, it would not be possible to boycott the elections in protest. The reason, this election would be held as the result of a mass movement. All these need to be explained to Khaleda Zia. Absolutely correct! As soon as possible. I called Khaleda Zia the same night. Hallo, this is Muhammad speaking. Go ahead, Khaleda Zia was at the other end. But you had said that he was prepared to leave the country. Yes, I told you what he told me then. Now, he has been forced to change his decision by the Chanakyas to play as their pawn in the future elections. I would like to give you an analysis about the conspiracy if you like. I submitted to her the comprehensive gist of the analysis of Rabbani and mine. Your analysis is well justified. But the course you have suggested for that substantial financial resourse is required. At present to arrange that kind of fund from within the country would not be possible for me. Most of the moneyed people have already taken the side of Awami League and Ershad. They have taken for certain that Awami League and Ershad shall win the future elections. ershad had consficated all our accounts immediately after taking over. It is only I know how I have managed to reach up to this! For the elections money is flowing like tidal wave from across the boarder. Agaist that tidal wave how can I sustain and compete absolutely empty handed brother? You said it rightly. Besides, through those Gen. Zia used to raise funds for politics, most of them had jumped into Gen. Ershad’s band wagon soon after Gen. Zia’s demise. Still they are with him that is known to me. Khaleda Zia might had been little embarrassed listning to what I said. I want to make a request, if you don’t mind. I had requested Shapan, your younger brother to participate in the elections but he begged excuse saying that he is not interested in politics. Can’t you be at my side before the elections? As per the government service rules, it is not possible. More over, the reason due to which it was not possible for us to accept his offer that he extended during his state visit to China to join him in politics that still remains even now. Besides, on return whatever help or assistance I would be able to provide there would be many in the country who can do that. Therefore, if I could do the things which might not be possible for any one to do back at home. Wouldn’t that be more rational and paying? Fund and alliance with Jamaat are the two most vital issues for you in the up comming elections. I shall see and try what can be done to resolve these two issues staying abroad. Brother, I shall remain ever greatful to you for your sincere initiatives and all other things you are doing. Bhabi, We are not doing anything for the interest of any individual. All our initiatives are for the interest of the country and the nation. We are committed to carry forward the religious values and nationalist politics. We shall continue struggling as long as we live so that this spirit can take root in the soil of Bangladesh staying above any expectation or return. In the course of our this envevor if any individual becomes a beneficiary that is not a matter of any concerne to us. You please go ahead with as much as possible and we shall also leave no stone unturned in our efforts. What would be the result that would entirely depend on Allah Subhan Wa Tala. Let me be off for today. I shall again get in touch if and when required. Allah Hafez, I dropped the line. Extremely intiligent Rabbani could understand the gist of our conversation that was evidently clear from his ¾ questions. We decided to sit together tomorrow evening to chalk out our next course of actions. After dask Rabbanicame along with Nasreen. I had also returned from the club. Annual Inter Club Tennis Tournament was on at the Parkland sports club. This time I was playing for Nairobi club. I was also member of the Parklane sports club so some close friends were not taking this in good spirit. However, the misgivings were removed when I committed to play for Parkland sports club next year. After Rabbani and Nasreen arrived we had took our dinner and sat around the fire place in one of the sitting rooms. House maid Bitress came and went away after serving coffee. Keniya is one of the leading coffee producing country in the world. Mostly exported abroad. Small muddy hillocks and its temperate climate is very congenial for coffee production. Suddenly, arrived Altaf the head of house keeping staffs with the phone in hand. He said that Babu Sahib has called from London. I told him to plug in and took the receiver. He complied and left. It was not unexpected, Being impatient Babu and Neli had called again. Hallo, Dalim Bhai Babu speaking what is the news? The news is not very encourraging. I became disapointed sfter talking to Gen. Ershad yesterday, chainging his earlier decision he said after transferring power he would not leave the country. He thinks that he would win over 150 seats in the next election and form the government. If need be he would be forming an electoral alliance with Awami League. I was ashtonished at his such volta face change! Such reckless decision would only benifite Awami League. They would be forming the government and Gen. Ershad would be sent to Jail. What are you talking Dalim Bhai! Dula Bhai at the end had decided to help Awami League to form the government and then shall go to Jail? You had ruled the country for more than 8 years. Now at the fag end of your life with out being a servant of Hasina and a proven Indian agent rottening in Jail, it would have been lot better if you had sticked to your earlier decision to come out from the country and wait for an opportunity to stage back. But Gen. Ershad did not pay any heed to what I said. To be honest Babu, I am more concerned about Daisy Bhabi than Gen. Ershad. She is physically is a sick person would it be possible for her to bear all these hazards! Dalim Bhai, I have a request, could you come over to London for a day or two? If you could come then both of us would have tried together to convince Dula Bhai(Brother in Law) not to take such a self deafiting decision. We could also tell Apa(Daisy Bhabi) to exert herself to prevail on Dula Bhai to come out. It seems that you are not trusting me! No, No, how could you ever think that? The question does not arise not to trust you. With out trust, how could I make that request? If you would have come then we all together could give a last try. All right, I would try to reach secretly. Babu, have some guests thats why I must end here please don’t mind. Thats okay, we shall then be waiting for you, Allah Hafez. I told everybody what transpired between us. Nimmi is a lady of few words. Suddenly, she opended up. Why are you trying to salvage Khaleda Zia and working so that she can win the elections? She would be persuing her deseased husband’s politics more vigorously. What good it would bring to the country and the nation? Khaleda is a lesser evil compared to Hasina, said Rabbani. Here I beg to differ, evil is an evil, there is nothing known as lesser evil. Character wise both Hasina and Khaleda are the two sides of the same coin. Is it true brother, Nimmi had said that Zia was not dependable during the liberation war? 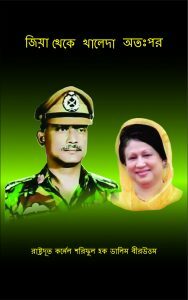 Time shall prove Khaleda to be if not more but no less fraudulent and mischievous than her late husband General Ziaur Rahman. In that case it must be accepted that there is weight in what she says. But at present there is no other alternative but to try our best for Khaleda’s victory! There is no grain of doubt that should Awami League some how wins this elections then certainly they will uproot all the nationalist and Islamist forces from the soil of Bangladesh. In the strangulation of expansionist India in socio-economic sectors Bangladesh would be loosing its self esteem and inentity. The future would be like that of Nepal, Bhutan or Sikkim. Therefore, having knowing everything we have to try the Lesser Evil. Some how now Khaleda Zia has become the champion of nationalism and Islamic values in the eyes of the majority people of Bangladesh. Considering that reality we must try our best to contribute no matter how meger that might be for Khaleda Zia thinking about Bangladesh and its Muslim majority. Rightly so. My friend then you work out a road map for this war as I am failing to understand from how to begin and where to end! Rabbani informed, after returning home last night he had already thought about the road map. Should I agree then we could move accordingly. Thats fine, tell me what is your road map like. Last ditched efforts must be made through Babu to get Gen. Ershad away from Awami League and bring him out so that he can not cut the vote of BNP. For khaleda’s fund, we have to go around all the friendy countries and through the good offices of our influential friends must try to convince the people in power for financial support. BNP should be convinced to forget all differences and bitterness of the past and must forge an electoral alliance with Jamaat and all other like minded anti Indian smaller parties and groups. Our focus should be some countries of the Middile East, PRC and Pakistan. If we succeed to convince the influencial people in the corridor of power with our presentation then Pakistan could become the main catalyst. The Election Commission nust deploy the armed forces to ensure safty of the voters. I listened that Rabbani had said. Great! I have no two openion or question on your road map. Lets begin then with out westing time having faith on Allah, what do you say? In that case, let me take the short trip to London tomorrow or day after. Why day after, you leave tomorrow, sooner the better. There is no justification what so ever what Dulabhai is saying. Therefore, there is no other alternative to save themselves from any untowards consequences but to leave the country. They must get out from the country forthwith otherwise, that scope would not be there soon. Then nothing can be done. At our request Dalim Bhai has come up to London so that we all could make you understand the ground realities so that you can decide to cone out. Tomorrow he would let them know about his final decision. There after Babu dropped me back at my place. I am trying for the last time to bring out Gen. Ershad from the country. He would inform his final decision tomorrow. But at this end I learned that Hasina is going to hold a press conference to stopped his departure. There she would be cautioning me and will tell the people that she has come to know that some people are trying to give a safe passage to the deposed corrupt dictator so that he can fled from the country. At no cost that would be allowed by the people and Awami League. She would also demand to send him to Jail forthwith. In this case if Ershad does not decide to leave the country befor her press conference then it would not be possible to send him out said Khaleda Zia. Okay, let me see what can be done. The situation is getting very comlicated. I was extremely worried after hearing whatever Khaleda Zia had said and called Babu and told him to pick me up again. Within 10 minuites Babu arrived. What is the matter Dalim Bhai, why did you asked me to pick you up urgently? This is not the time to break down Babu. Time is short in the power play so with out westing any time we must make our last ditched efforts to convince Gen. Ershad to come out that is why I was compelled to call you so urgently. We reached his house again. Sir, perhaps this is going to be my last call to you. I am not your enemy. I personally respect you both. Therefore, very humbly I am submitting again why are you stepping into the new trap to spend rest of your life as a slave? Why are you putting Bhabi also into trouble? Is it befitting at this age? Enough is enough, Sir. Babu informed him about the latest news that had been conveyed by Khaleda Zia and was literally beffing him to leave the country. The news can’t be true. Because, it had already been decided if he fails to get the simple majority then he would form a coalition government with Awami League. In view of the above, Hasina being the chair person of Awami League can not raise this demand for their own interest. So, I have decided to persue my politics remaining in the country as I am going to win the next elections. Lust of power had made Gen. Ershad totally blind. Due to his such one track attitude Babu and Neli was crying at this end and Daisy Vhabi on the other. It was not known to me that I shall have to be in such an ackward situation! Sir, since you and your cohorts had been taken into protective custody you all are unable to communicate with one another, is in’t it? Under such circumstances why did I take the initiative to contact Khaleda Zia and you some how? I shall be obliged If you could let me know what is my personal interest in this. Gen. Ershad became quite. To be honest, I never thought what could be your interest! Then think now and tell me. Also please explain the reason, why I had come up to London incognito at the request of Babu and Neli and talking to you so much? May be you love us that is ehy other than that I can’t think of any other reason. You are averecious and a selfless patriot. I have never seen you requesting for any favor for yourself from any one ever. Your observation is partially correct. Besides, there is one more reason that is at this juncture, I may be slightly better informed about whatever is happening in the political arena than you or Khaleda Zia. I am not telling anything being apprehensive. Whatever, I am saying that is based on facts. Accepting this khaleda Zia is talking to me. At my request, even after knowing everything about your role in Zia’s killing she had promised to arrange a safe passage for you along with your family to leave the country. This was not so easy to make such a commitment. But it is realy painfull that you are not accepting the hard realities. So, should I take it that you are not trusting me? How could you think that I am not trusting you? You have compelled me to think so, Sir. Even after this I am requesting you for the last time, do come out leaving the country by to night. The truth about what Babu had conveyed that would be proven by tomorrow. You want to enjoy that being a prisoner in the country or want to know in a free atmosphere coming out from the country, this should be your primary consideration at this moment. Leave me aside, the way all here are begging you, this should have been heeded to. Now, as my patience has run out I must say that you are a very selfish and power hungry person. Your domisticated Generals of the army had failed to keep you on the Thrown, as a result you all are now under house arrest. Feeling the wind Awami League and Jamaat had deserted you. You had to step down under pressure. None of your foreign masters came forward to salvage you. All of them are now busy in thinking how to use you as the toilet paper. After knowing all these information you are still day dreaming! This is really astounding! You are not aware at present the people are so much in furry that if they could lay hands on you then they would have chopped your well build body into pieces and throw those as bates to the kites and vultures. With lot of hard work the opportunity that I could manage you failed to appreciate that and therefore, very soon you will see what would be the consequences. There was no darth of sincerity in this endeavor of mine. Even after all these like an insaine person you are hysterically repeating the same thing that you are going to win the elections and form the government! And for that you would not avail this opportunity. Good enough, I shall also see what fate the fallen dictator Gen. Ershad faces in the near future. From now on, I have no responsibility any more. No more talks would be held between you and Muhammad. you have to learn the lesson fron the destiny. Remain close to Allah, He would help you in future. Besides, we shall also be praying for you. Allah Hafez. Dalim Bhai, We shall remain ever greatful to you, I shall not belittle you with thanking. May Allah bless you. I consoled both Babu and Neli and came back home. Staying in the Jail, Ershad would not be able to influnce the elections much. But, being the Ex President he would get some seats. That would be his protective shield.